The Solana Strep Complete Assay is a rapid in vitro diagnostic test for the qualitative detection of Group A β-hemolytic Streptococcus (Streptococcus pyogenes), and pyogenic Group C/G (streptococcus dysgalactiae) nucleic acids isolated from throat swab specimens obtained from patients with signs and symptoms of pharyngitis, such as sore throat. 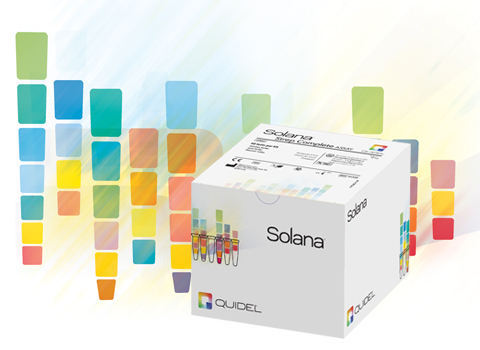 The Solana Strep Complete Assay, when performed on the Solana instrument, allows for the rapid, accurate detection of Group A and pyogenic Group C/G Strep without the need for culture confirmation. A throat swab sample or an aliquot of liquid transport media is lysed by simple heat treatment, diluted, and added to two Reaction Tubes, one containing primers and probes specific for Group A Strep, the other containing primers and probes for strep dysgalactiae HDA reagents including primers specific for the amplification of the DNAase B (sdaB) sequence as well as sequence specific probes. Competitive process control (PRC) is included in the Lysis Tube to monitor sample processing, inhibitory substances in clinical samples, reagent failure or instrument failure. Results are displayed on the touchscreen, can be saved to the instrument, printed, and are capable of being sent to the LIS and exported through one of Solana’s four USB ports. Solana Strep Complete is supported by the power of Virena®.